In 1937, the Walt Disney Studios released its first fully animated feature film, Snow White and the Seven Dwarfs, and pioneered a new form of family entertainment. More than seven decades later, Walt Disney Animation Studios continues to honour its heritage through animated films that combine beautiful artistry, masterful storytelling and ground-breaking technology. 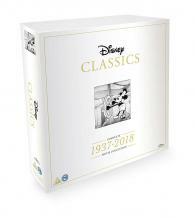 **Please note for the Blu-ray collection that the 5 films below are DVD discs as they are not available on Blu-ray**: Saludos Amigos (1943) The Three Caballeros (1945) Make Mine Music (1946) Melody Time (1948) The Black Cauldron (1985.